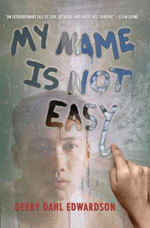 My Name Is Not Easy by Debby Dahl Edwardson is the loose story of a group of young teens who are white, Indian and Eskimo gathered at a Catholic boarding school in remote Alaska in the 1960s. It speaks to the hardships and injustices inflicted on the native people, but also follows them as they come of age, deal with tragedy and struggle to find their own voice. It’s an interesting historical perspective and study of these characters, but the plot lacks direction and focus. It’s more a snapshot of life than a driving story. “Luke knows his I’nupiaq name is full of sounds white people can’t say. He knows he’ll have to leave it behind when he and his brothers are sent to boarding school.” The theme of the title is subtle throughout the book, but the fact that he goes by Luke throughout the entire book is powerful. It’s also powerful (but still subtle) when he finally does use his name. Early in the book Luke’s youngest brother, Isaac, is taken away because he’s too young for boarding school. Rather than return to his family, he’s somehow adopted by a family in Texas. While it’s a small part of the story in terms of space (but not theme), it could have been the entire story. It’s unfathomable that something like that could have happened only 50 years ago, but it did. Many of the stories and circumstances of this book are based on real stories. In addition to the illegal adoption, there was medical testing on natives, a native hunting protest and Project Chariot—a plan to use nuclear bombs to create an artificial harbor nobody needed (a plan that seems comically stupid by today’s standards).